I love getting to teach my kid about plants and animals and all the beautiful people in the world, and I love her joy in learning about it. From infant to toddler and even preschool through grade school, children will remain captivated with the wonderment this book inspires. 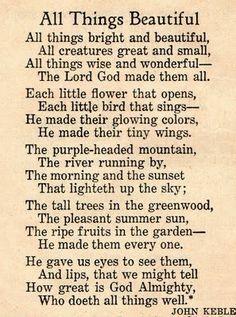 The tall trees in the greenwood, The meadows where we play, The rushes by the water, We gather every day;-- He gave us eyes to see them, And lips that we might tell, How great is God Almighty, Who has made all things well. A child will enjoy repeatedly the pictures as they listen to the words. Such a great hymn and such a great book. Byrd is a church music student of Dr. Each little flower that opens, Each little bird that sings, He made their glowing colours, He made their tiny wings. The purple-headed mountain, The river running by, The sunset, and the morning, That brightens up the sky; The cold wind in the winter, The pleasant summer sun, The ripe fruits in the garden, He made them every one. It's basically a poem about the beauty of creation. Cut-paper collages in cheerful hues depict scenes of people, animals, and nature. God is creator of, and in control of all of it. This piece has numerous other adaptations and can been sung in tune to several different melodies. Sample text: All things bright and beautiful, all creatures great and small. 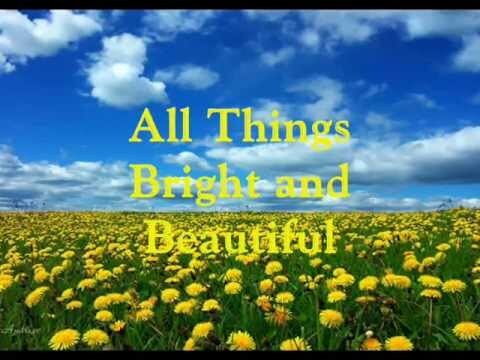 All Things Bright and Beautiful ~Cecil Frances Alexander All things bright and beautiful, All creatures great and small, All things wise and wonderful, The Lord God made them all. I read this with my son almost every morning and we discover new images and beauty in the illustrations every time. The text of the book is the lyrics to the song by the same title, which I remember singing as a child. She uses bright, warm colors to capture a child's attention. Each little flower that opens, each little bird that sings. Following the lyrics to the titular hymn, Bryan uses brilliant colored, hand scissored paper to compose multi-layered, symbolically engaging renditions of each line. To buy this book at the lowest price,. Otherwise, this book should be skipped. This children's book, follows 3 children as they explore the world around them, discovering God's creation. And one small issue is that the book comes with a dust jacket. The purple-headed mountain, The river running by, The sunset, and the morning, That brightens up the sky; The cold wind in the winter, The pleasant summer sun, The ripe fruits in the garden, He made them every one. In other parts of the book, the animals are featured and have their stripes, fur, etc. The cold wind in the winter, The pleasent summer sun, The ripe fruit in the garden, He made them every one. It is guaranteed to be one of those warm and fuzzy moments when you read it to a child you adore and hope the world is indeed beautiful for. People who like the hymn would probably appreciate this. I really enjoyed this picture book, and think that the illustrations are sure to appeal to young children. Upon her death in 1895 in Londonderry, the cathedral bell began to ring announcing her passing to the city. The awe of nature has been captured both with the lyrics of the hymn and the illustrations that were provided while the actual lyrics to the song were included in the back. I was not compensated for this review. I've found myself on more than one occasion slowly flipping the pages, just allowing my eyes to wander about. If parents are willing to sit down with their children and read, especially starting before they are two years old, this book will help to spark the imagination of practically any child. I think the target age should be 2-5. It may even get your kids to try and attempt this sort of art on their own. Cecil Frances Humphreys Alexander 1818-1895 was an Irish hymn writer and poetess. Each illustration holds its own, as there are no weak links here. I must have missed in the description that this was a religious book, and would likely not have chosen it if I had noted that simply as we are not a religious family, however that said it is a simply beautiful book. I love the idea of this book and I admire how well it was executed. I'd highly recommend this book to anyone with young children that they want to teach of God from their earlist days. Nothing new or special there - it's really all about the artwork and format. 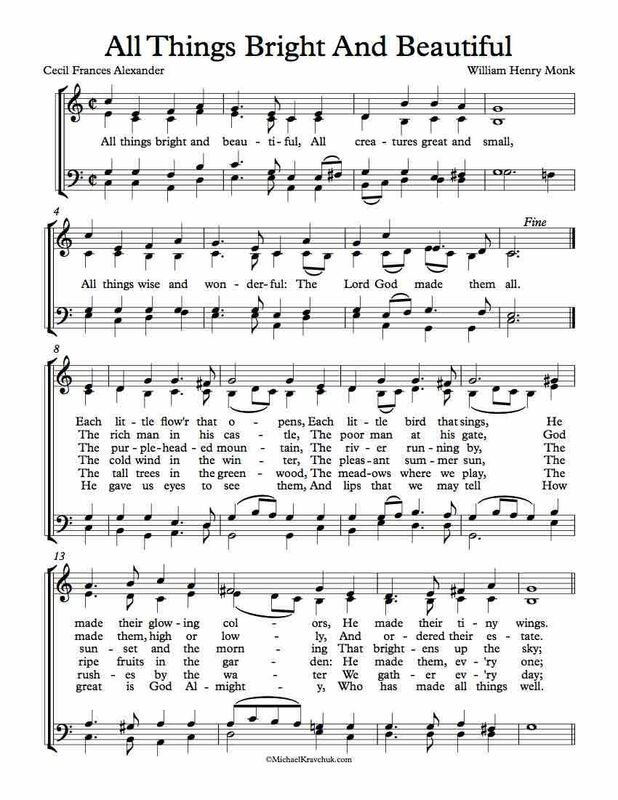 The last page gives the music for the hymn. Each little flower that opens, Each little bird that sings, He made their glowing colors, He made their tiny wings. The text is a nice large size. Anna Vojtech's illustrations enhance Cecil Frances Alexander's hymn. This is a great hymn, one of my favorites especially the arrangement by John Rutter. The birds flying over the rainbow! So many beautiful animals and plants and people! For my review policy, please see my Disclosure page. The children are adorable, the colors are vibrant, and the animals are amazingly lifelike. The rich man in his castle, The poor man at his gate, God made them, high or lowly, And ordered their estate. This book is large not thick but wide but the art inside is beautiful! In addition, the children cut-outs in the book were nice, but they had no pupils in their eyes -- pupils are what make people and animals alive and vibrant, and she definitely didn't connect with these pictures. It's perfect for its targeted age groups, and for adults who enjoy sharing books with their little ones. It was actually confusing for her. I recommend the book to all parents and encourage them to read it nightly, taking the time to discuss what they see in the pictures. I read this book to my best friend's daughters. From infant to toddler and even preschool through grade school, children will remain captivated with the wonderment this book inspires. The book is actually a poem by Alexander which she penned in the late 1800's in England. She loved the colors, and being able to read some of the words.